It’s been another vintage year for press funnies, and once again we’re asking you to choose the very best – or should that be worst? – media gaffes from the past 12 months. A couple of them were sufficiently serious to be featured as news stories rather than in our regular Friday Funnies round-ups, but no matter, they are also included on our shortlist. Last year’s prize went to the Welywn and Hatfield Times for its unforgettable ‘Dead Man Found in Graveyard’ bill, so now’s your chance to select an equally worthy successor. Scroll down to see, in chronological order, our ‘dirty dozen’ from 2010 and then choose your winner by clicking through to our special poll. 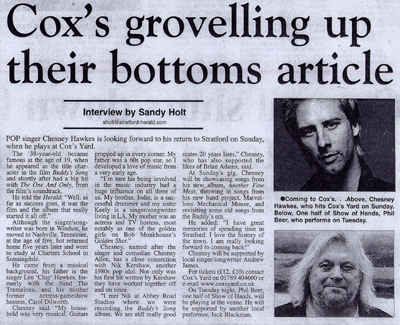 We couldn’t believe our eyes when someone sent us a copy of this Chesney Hawkes interview from the Stratford Herald. Neither, I suspect, could poor old Chesney. We’re not sure what a reverse jobs blow looks like, but maybe the MPs featured in this Peterborough Evening Telegraph story would be able to enlighten us. 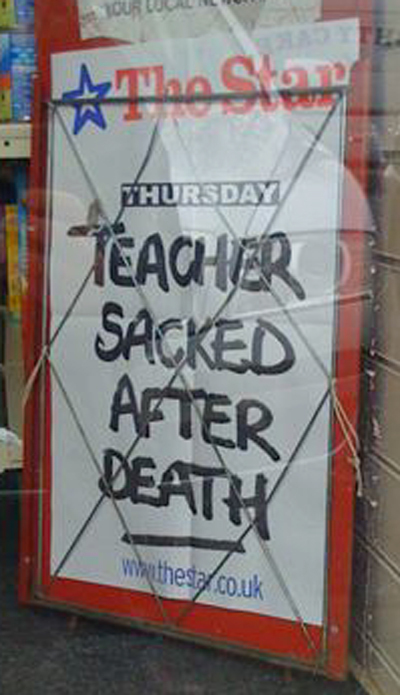 And the first of two nominations for The Star, Sheffield, features a teacher seemingly having a run of bad luck…. 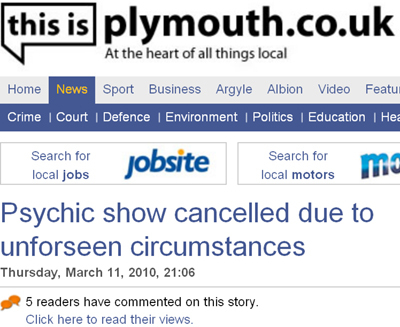 Next up, a Plymouth Herald story about a psychic who really should have been prosecuted under the Trade Descriptions Act. Sheffield Star again, and the infamous case of the rogue’s gallery that was missing some of the rogues. But there were few smiles at the Ludlow Journal after this caption blunder in a story about a bellringing coach led to hundreds of copies being recalled. On the home straight now, and how could we leave out Glasgow Evening Times reporter Sarah Swain’s amazing video interview with entertainer John Barrowman, although you have to watch it to the end. 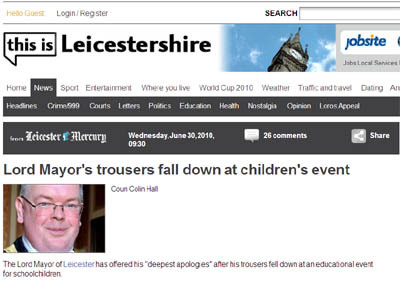 This Leicester Mercury story about an unfortunate accident befalling the city’s mayor was not a media gaffe as such, but gets into the list thanks to a great headline. 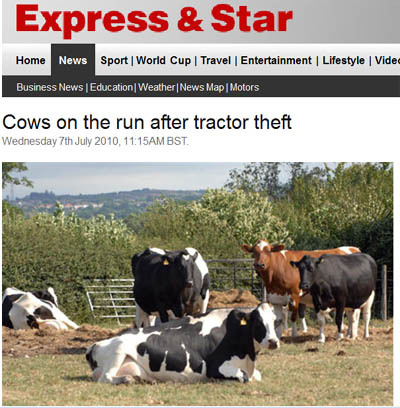 In terms of pictures that don’t quite do justice to a story, this Express and Star tale about some escaped cattle is surely up there with the best of them. 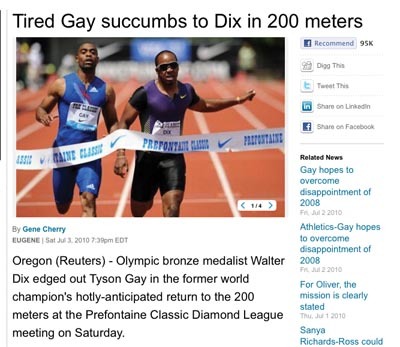 And finally, news agency Reuters earns another ‘outing’ for its report on a dramatic end-of-season encounter in the athletics world. 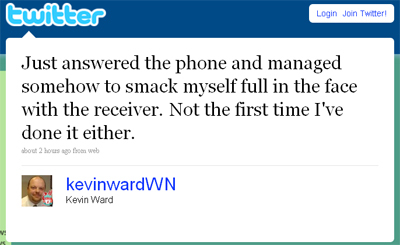 So there you have it…our top 12 from 2010. To vote for your favourite, go to Pollcode.com and select from the list. Voting will be open until the New Year, with the winner to be announced on Friday 7 January. One final thing: Our Friday Funnies feature depends on the contributions of our eagle-eyes readers so a big thank you to all who sent them in during the past 12 months. I like the running joke about life being local on weekly papers run from distant Kremlins. Someone’s avin a larf but it ain’t those working at the coal face.